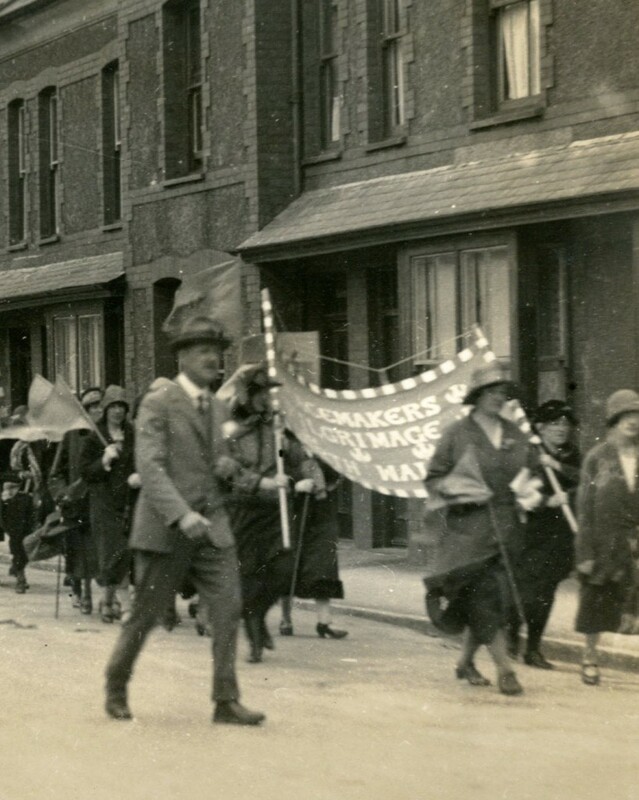 Many women in North Wales were active in campaigns for peace and disarmament in the late 1920s and early 1930s, whether by marching across the country in the Peacemakers’ Pilgrimage or collecting tens of thousands of signatures for the Disarmament Declaration. Discover more through the archive amassed by Mrs Gwladys Thoday from Llanfairfechan, a tireless activist for the abolition of war. This resolution was discussed and passed in villages and towns throughout North Wales to encourage participation in the Peacemakers’ Pilgrimage of 1926. Two thousand women from a number of villages in the hills around the town of Pengroes in Caernarfonshire arrived at the market town on May 27th 1926, many carrying the blue flag of peace. This was the beginning of their active involvement in the Peace Pilgrimage which would culminate later that year, in a huge demonstration in Hyde Park in London. Over the following five days a group travelled 150 miles in cars and charabancs to join up with other groups of women in Chester. Along the way they stopped and spoke to crowds. A large meeting was held in the ruins of Conwy castle. They continued through Colwyn Bay and Rhyll, holding meetings at each key assembly area. In all fifteen meetings were held. Many joined them and others encouraged them on their way. Welsh and English hymns of peace were sung at all meetings. 28 of the North Wales Pilgrims took part in the 10,000 strong demonstration at Hyde Park. There were 22 platforms of speakers. Two of the speakers were Mrs Gwladys Thoday and Mrs Silyn Roberts; the latter spoke in Welsh. They would later become the English and Welsh speaking secretaries of the North Wales Women’s Peace Council. 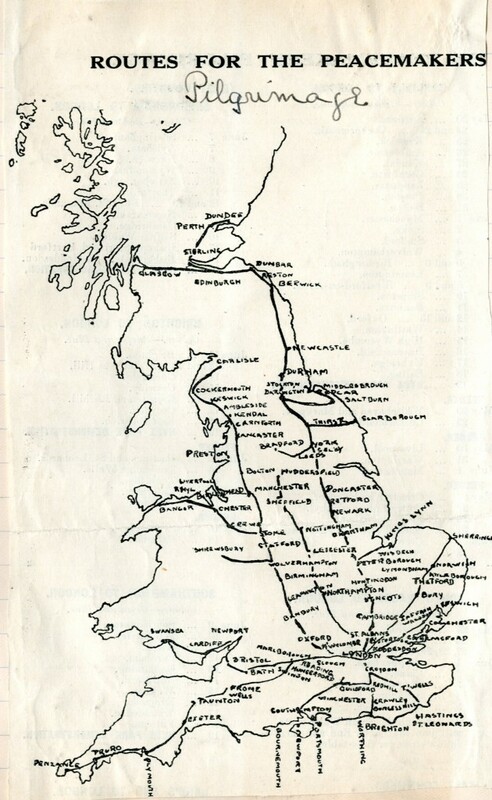 Plans for the North Wales Pilgrimage had begun only in April 1926 by a small group with the finances of a few shillings. In all, fifty towns or villages were involved, many religious denominations and all political parties. Soon after the pilgrimage the North Wales Women’s Peace Council was formed. In 1928 the North Wales Women’s Peace Council (NWWPC) became affiliated to the Women’s International League for Peace and Freedom (WILPF). WILPF had formed in April 1915 when women of different nations came together to oppose the First World War and campaign for peace. Joining WILPF helped link the women of Wales to other parts of Britain and beyond, to the wider international peace movement. That year, Frank Kellogg, Secretary of State for the USA, put forward a proposal to renounce war to the governments of the USA, France, Germany, Great Britain, Italy and Japan. WILPF had a huge campaign in support and asked their British counterparts to join them. NWWPC became very active in gaining support for the treaty. They held meetings throughout North Wales in order to pass resolutions urging the British government to support the Kellogg Pact. In all, 174 resolutions were passed. Of particular interest were the meetings hosting Miss Balch, from Massachusetts, of the American Women’s International League. She spoke to four meetings in Wales including at Bangor and Wrexham. Women travelled many miles to hear the American speaker, often being put up for the night by local members. In July the Kellogg Pact was signed by representatives of 14 countries. On 25th July 1928 the campaign culminated in a mass meeting at Queen’s Hall in London, where NWWPC were keen to have a significant presence. They urged London Welsh women to join them and in all there was a block of 200 women from Wales present. 50 additional nations later signed the Treaty and it was ratified at the beginning of 1929 by the USA. Now, the NWWPC turned their attention to the general election. They wanted to ensure that the Kellogg Pact was implemented and ensure that whoever won the election would promote disarmament. This was also a significant election for women since it was the first time they could vote on equal terms as men. Moreover, women’s votes outnumbered men’s by over a million. It was a crucial opportunity for the campaigners to be heard. Labour, under the leadership of Ramsey MacDonald, won the general election of 1929. Campaigners argued it was essential that disarmament followed the Kellogg Pact. Action was needed, not simply words. On 6th February 1930 Mrs Gwladys Thoday, joined a deputation organised by the Women’s Peace Crusade to the London Naval Conference. They met with the Prime Minister, Ramsay MacDonald, and senior delegates from USA, Japan, Australia and New Zealand. The women delegates urged the statesmen to build on the Kellogg Pact and reduce naval armaments throughout the world. Only a few of the women campaigners were allowed to speak. 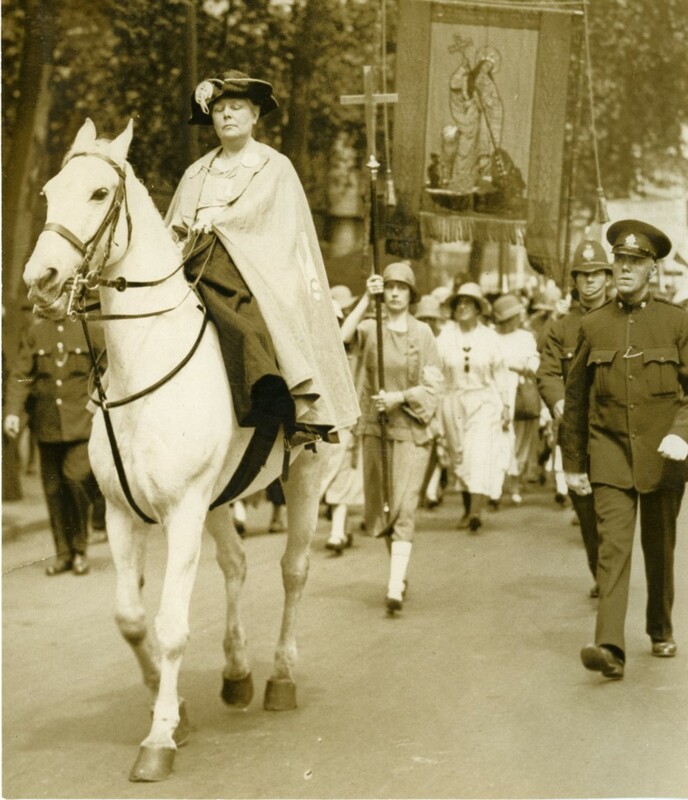 Lady Horsley presented the argument on behalf of the two million women in the Women’s Peace Crusade. Mrs Corbett Ashby, President of the British Commonwealth League, made particular mention of ‘the women of Wales’ and their ‘amazing campaign – represented by Mrs Thoday’. Gwladys Thoday presented resolutions from 110 meetings in North Wales, calling for a reduction in naval armaments. The London conference extended the terms of the Washington Naval Treaty that had aimed to prevent a naval race after the First World War. The treaty was ratified on October 27 1930. Following the London Naval Conference the Women’s Peace Crusade focused on the Disarmament Conference planned for Geneva in 1932. Lord Cecil, a key advocate of the League of Nations and president of the League of Nations Union, was reported to have told journalists that ‘the success of the disarmament conference would depend on public opinion’. NWWPC supporters took heed of this statement. They put a huge amount of effort in 1931 into asking every adult to sign the Disarmament Declaration. By the end of the year, 122,198 people in North Wales had signed the declaration, representing one fifth of the population. Together with the rest of Wales, 202,000 people, or one tenth of the population of Wales, signed. Despite all their hard work and many remarkable achievements, NWWPC’s 1932 annual report expresses concern about the lack of progress towards disarmament following the World Disarmament Conference. Activists continue to take action against the arms trade in North Wales. Wrexham Peace and Justice Forum have highlighted alternatives to global military spending and protested against promotion of the military to children. It was women from Wales who started the protests in 1981 against the siting of nuclear weapons at Greenham Common. The tradition of peace activism continues in Wales today with organised opposition to the NATO summit in Newport and against drones at Aberporth.